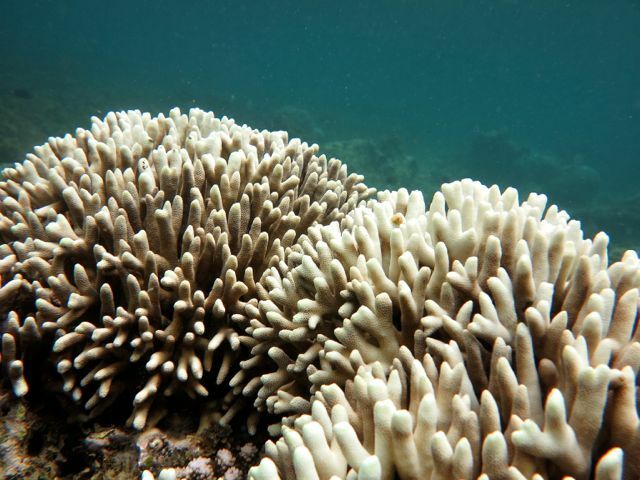 Bleaching and paling of corals varied from highs of 30 -55% in the shallow zone, to less than 10%, but many reef areas had poor coral cover, evidence of past stress from bleaching, overfishing and river outflow. The winds had shifted to the south-east “kusi” monsoon and the rain was torrential as I set off on Monday 11th April to survey the reefs in Kenya’s southern most Marine Park and Reserve – Kisite and Mpunguti. My focus was on the reef fish populations to get a quick baseline of population abundance and diversity before the impacts of coral bleaching take their toll. We knew the bleaching had started from observers in Kenya, but not the extent of it in this southern area. 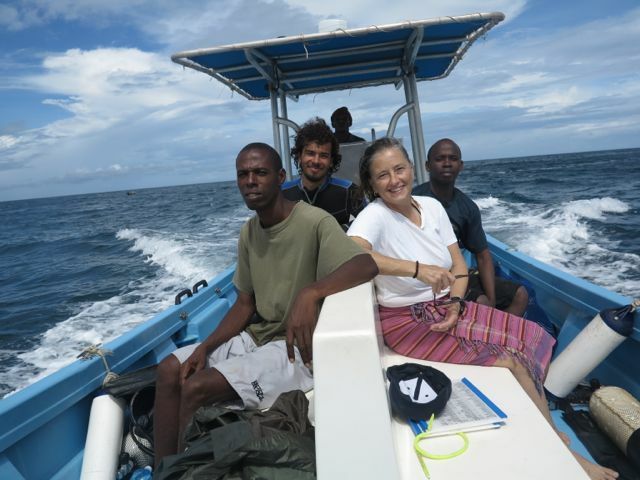 Working with the Kenya Wildlife Service Warden of the Park, Mr Wambua, his boat crew and monitoring team ranger Mohamed Namuna, and divers Peter Musembi from Arocha and Ewout Knoester a Pilli Pippa volunteer, we dropped into the ocean first at Kisite Island. This is one of the most popular tourist snorkeling areas in Kenya because the reef is so shallow. However, being shallow where the water gets the hottest may also be its demise. The next day we went to Mako Kokwe, the southern most reef in Kisite Park and close to the Tanzanian border. Too far for tourists and regrettably the target of Tanzanian dynamite fishers in the 1980s, so much of the reef was destroyed at that time. Having not dived there for 10 years I was delighted to find extremely high hard coral cover, around 70%, on the upper terrace at ~2-9m depth, dominated by Porites cylindrica and Acropora spp. Considering its dynamite history this coral cover was excellent. Deeper, the reef slope consisted of enormous Porites bommies and even a white tip shark swam by – a very rare visitor to Kenya’s reefs these days. 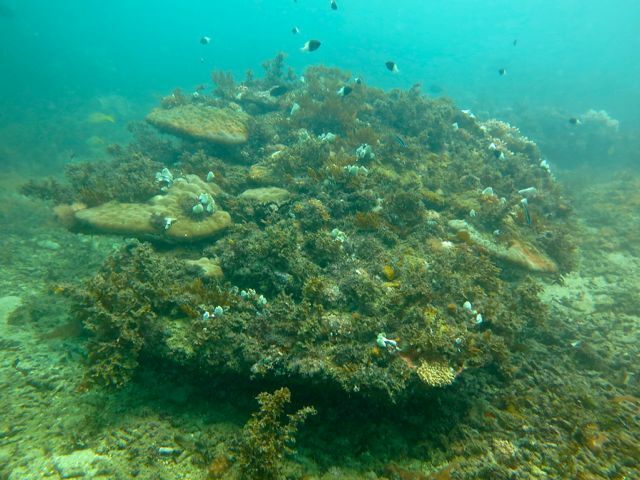 However, bleaching and paling of Porites cylindrica was also high here with estimates of 30 -55% in the shallow zone, and some bleached smaller colonies of the massive Porites were in the deepest zone. In many areas Mako Kokwe’s reef structure resembles demolished corals that have then consolidated a hard base and on which new coral growth has in places completely re-covered the reef – mainly with Porites cylindrica and Acropora spp. 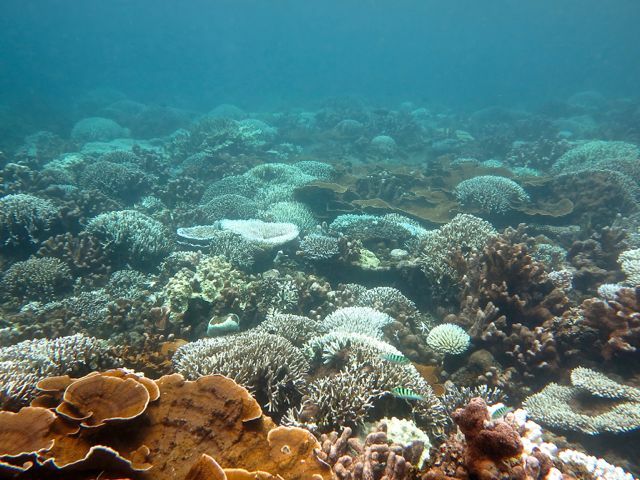 With this remarkable recovery it is hard to now be measuring high levels of bleaching on this vulnerable reef. The reefs in the National Reserve at Mpunguti ya Juu and Mpunguti ya Chini were devastating to see –I have not dived these reefs since the 1980s. 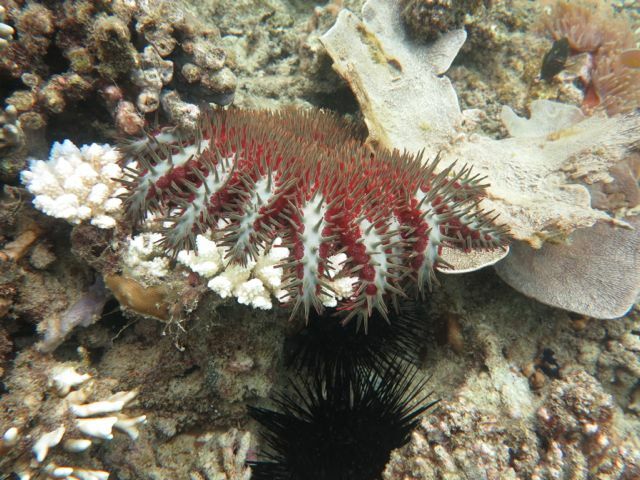 They are largely dead (up to 70% in places), except for a large area of Goniopora on Mpunguti ya Juu which typically grows in mono-specific banks with low rugosity and consequently poor in fish species diversity. With little live hard coral the bleaching was inevitably negligible, seen on occasional small colonies of Acropora, Pocillopora and Porites cylindrica. Sargassum was common, especially at Mpunguti ya Chini and with sea urchins, crown of thorn starfish and discarded fishing nets also seen at these two reefs, their condition is clearly poor. The water was consistently 29- 30 degrees and therefore with these normal temperatures, the cool winds of the kusi monsoon, the heavy rain and an anomalously cool February, we are hoping that the bleaching may not extend to coral mortality at Kisite and Mako Kokwe so these Park reefs continue to thrive. Stay tuned to our Bleaching Alerts for how this El Niño pans out.